A 58 year old female presented with a left adnexal mass. Gross examination showed a 516 gram predominantly cystic mass, 16.0 cm in maximum dimension, with nodular yellow masses lining the inner cyst wall. H&E sections only show thyroid epithelium with areas of papillary and follicular architecture. Some areas demonstrate nuclear features of Papillary Thyroid Carcinoma, including nuclear enlargement, nuclear crowding, nuclear grooves, and a few nuclear pseudoinclusions. 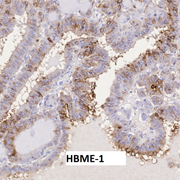 Areas with cytologic features of Papillary Thyroid Carcinoma stain positive with CK-19, HBME-1, and Galectin 3. 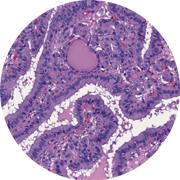 These stains are reported to differentiate benign thyroid proliferations from Papillary Thyroid Carcinoma within a Struma Ovarii or Strumal Carcinoid. Malignant Struma Ovarii are rare tumors that have the histopathologic features of Papillary Thyroid Carcinoma and can be associated with RET, RAS and BRAF mutations. Most of these tumors do not progress to extra-ovarian disease, recurrence, or metastasis.